Campaign: The Queen's Rule in the Monarch Cycle will come once King Stephan dies, however, with his daughter, Nirnya, missing, the sickly monarch has sent out his two sons to find her. With this unprecedented situation, the Kingdom is on edge, as civil war threatens the peace that has lasted generations and all sorts of unsavory types flock to inns and hideouts, forming gangs of bandits and lawless militia groups, sowing discord and strife into the mix. To make the situation even more precarious, the two sons are known to be bitter rivals with the eldest son Halfred supporting the traditional exchange of power, and the younger, charismatic son Loeric voicing open defiance of handing power to anyone but himself. 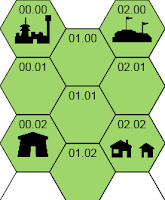 Homebase (Hex 0) (0000): Mariscon - The capitol city is (barely) keeping the peace through a tight application of the law by Chief Constable Gerishard and his band of magically-enhanced Town Guards. The local Thieves Guild and two rival Assassins Guilds have stepped up their activities in recruitment and acquisition of funds, leading to an escalating arms race between them and their favorite targets of rich merchantmen and noble families, as well as the Town Guard. The annual holiday of Six Days Harvest Feasting threatens to bring in an influx of drunken, partying tourists who will make this volatile situation even more so! Location 1 (0002): Loeric's Camp - A tent city has sprung up around Loeric's camp as many are answering his call for mercenaries, adventurers, searchers and investigators in order to find (and eliminate) Nirnya, and secret groups out to stop his brother from finding her. Alarmed by the prospect of Mariscon descending into chaos, he's also sending back some of his personal guard to help keep the peace which also will to promote support for his claim to the throne should Nirnya not be found. This has left him open to assassins, sent by Nirnya to eliminate her biggest threat. Location 2 (0200): Halfred's Center - The popular son, Halfred, is enlisting mages, clerics, soothsayers and psychics out of the eclectic university town of Silvergrad, most of which are quacks and simply draining him of cash. Halfred is dutifully following any leads, some of which are simply crazy adventures to find a mythical artifact, needed spell component or (more recently) attempts to simply to get more funds for Halfred as he burns through gold quickly. Rumor has it that he may know the location of the Queen's Crown, a relic of the First Queen who conquered these lands from the ravaging giants centuries ago, and that has gotten the attention of Nirnya as she seeks to infiltrate his close circle of advisers. Location 3 (0202): Lelistein - The quiet town harbors a dark secret, the inhabitants are all thralls to the mad daughter, Nirnya. Her arcane powers are growing quickly, as quickly as her lust grows to conquer the Kingdom and subjugate its inhabitants to fuel her need for souls to feed the demons that are the source of her abilities. She seeks to consolidate her powers and ensure that she would be unopposed before she reveals herself to the Kingdom, but Loeric may be the only one who can stop her, as he knows her dark secret! Oh wow, thank you very much for the kind comments! I hope you'll let me know how it goes with your players, please?